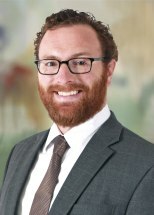 Martin J. Kraft joined Elk & Elk as an attorney in 2016. Martin has over seven years of experience representing disability claimants, helping them navigate the disability claims process and representing them at hearings in the Office of Disability Adjudication and Review. He has also represented disability claimants appealing to federal district court. Martin also has experience with class action settlement distribution, probate and tax law. Additionally Martin has achieved his National Social Security Advisor certificate from the National Social Security Association, LLC. The NSSA certificate promotes advanced Social Security education providing Martin with the knowledge to counsel clients on the best way to claim Social Security benefits in order to optimize lifetime Social Security income. After graduating from Miami University (OH), Martin attended Salmon P. Chase College of Law in Northern Kentucky, graduating in 2008. He currently resides with his wife, Ashley, in Covington. Martin enjoys traveling, spending time with his family, hiking with his dog Rush and barbecuing.